Unsalted crunchy peanut butter, made with 100% organic peanuts. Luxuriously thick, with a richness of flavour that made it a clear winner in our taste test. There’s no added palm oil or lecithin stabilisers, no salt or sugar. Just good peanuts, roasted without blanching to bring out maximum flavour. Simply give it a stir before eating. Store in a cool, dry place. Once opened consume within 3 months. The peanuts in this butter are grown by the Yishui Xingye Association, a group of 58 small-scale organic farmers in the Shandong province of China, on the lower course of the Yellow River. 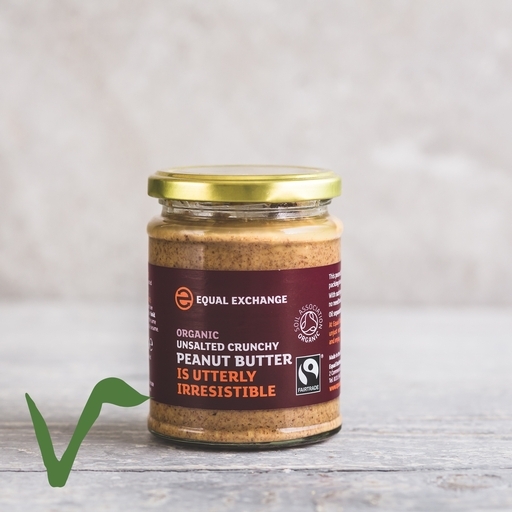 Equal Exchange are Fair Trade pioneers. Since this workers’ co-operative was founded in 1979 by three aid volunteers returning from Africa, it has worked with a wide range of farming communities around the world to produce food that is fair, sustainable, and really tasty.